Spray a large slow cooker with non-stick spray. Set chicken breasts inside. Pour olive oil over chicken and stir to coat. Add all of the remaining ingredients to chicken except for the lime juice. Cover with lid and cook on low heat for 5 to 6 hours, or on high heat for 2 to 4 hours. Carefully remove chicken to a cutting board. Shred. 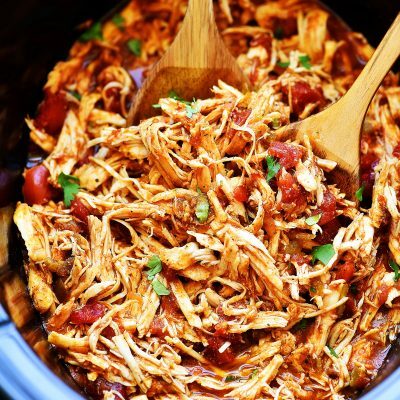 Place shredded chicken back in slow cooker and cover with lid. Let cook another 30 minutes. Squeeze fresh lime juice over chicken then serve.